Around these parts I occasionally doodle things and submit them, or post photography. Sometimes I even animate. I also run an online arts community called ambiance.gallery which I invite you to try out. Okay, enough about me now. We're holding a big collaboration chat over on Ambiance Gallery in case any of you are interested - the URL is ambiance.gallery/2018/08/02/co… (You can find this under Support>Collaboration on the menu when you're logged in). You might have seen my journal the other day about the Commissions Templates we're adding to the site resources over on Ambiance Gallery. This is just a quick update to say that we've got three on there to choose from right now. I'm aiming to upload a new one every day, so keep an eye on ambiance.gallery/downloadable-… if you're looking for a commissions sheet template - we'll have something for you at some point. Putting together a commissions sheet? You're free to customise the templates as much or as little as you want, and you can upload them anywhere and everywhere you like, (there's a license supplied which outlines this in the zip file). Right now there is just one on there which I put together myself, called 'Stroke Contrast' - and over time we'll be adding more. 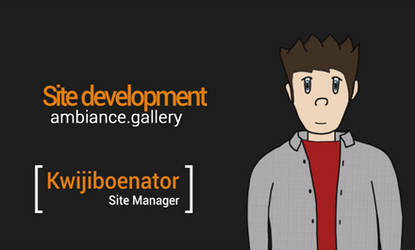 For a change, I thought I'd animate the ambiance.gallery development blog. I like how this came out, although I can't help thinking that I should have added more mouth shapes to the lip rig. This was animated in After Effects. PAGE 2: A quiet drink, is about to turn into a loud adventure. About this series: This is merely an extension of my storyboarding style. Whilst my artwork is basic and unsophisticated – the raw look I’ve used here works well for this story – I’ve drawn this series in a way which most manga artists use – to psychologically play on your sense of sound whilst you’re reading. For example, on this page, it’s outside at night time, so if you’ve ever been in a city centre at night time, you’ll probably try to imagine hearing the distant sound of traffic, thumping bass from music playing in bars as you make your way through the streets. If you can’t imagine the sound when you’re reading a comic/manga, it’s usually because you haven’t been in that same situation – so if you didn’t find that with this page, then you might find it with later pages. t h a n k . y o u . Oliver . e v e n . a g a i n .